Heavy-duty mobile shelving can handle loads from 7,000-30,000 pound for your heaviest storage challenges. Take a look at how we can help. Warehouses and industrial spaces are challenging landscapes. Millions of SKUs and pieces of inventory to manage, customers who expect additional services, and perhaps the most prominent issue—finding the right balance of labor. Or, maybe you’re not in a warehouse environment, but you’re in need of a solution to store heavy, bulky items. Here’s where heavy-duty mobile shelving can be ideal. 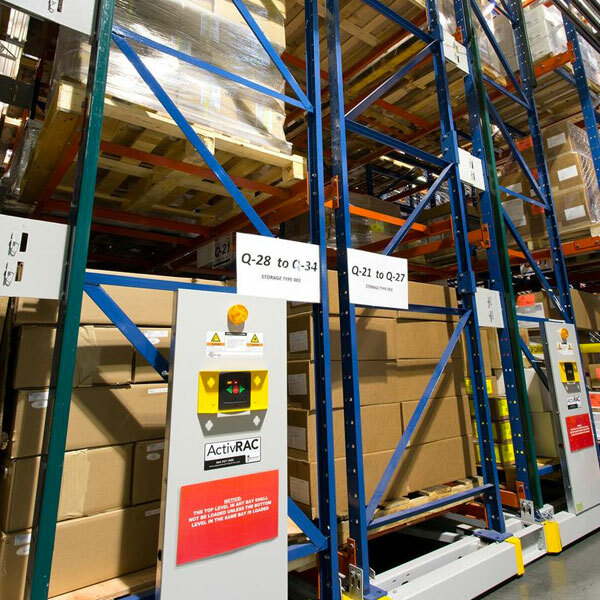 Spacesaver’s ActivRAC® heavy-duty mobile shelving can assist wherever a compact solution for heavy items are needed, eliminating empty space in your warehouse or storage area by mounting existing pallet racking or shelving on mobile carriages. These carriages have a load capacity of 7,000 to 30,000 pounds per carriage, making it a natural choice for a number of storage challenges—as well as a cost-effective alternative to leasing additional storage space or expansion. ActivRAC® heavy-duty mobile shelving comes in three different sizes, depending on the amount you need to store: ActivRAC® 7M & 7P, 16P, and 30P. Take a look below to see which option might be right for you. Bae Systems provides some of the world’s most advanced technology-led defense, aerospace, and security solutions—with the goal to deliver military capability, protect national security, and keep critical information secure. In order to keep up with that goal, security needed to start at their manufacturing warehouse. An ActivRAC® 7M heavy-duty mobile shelving system was utilized to provide 100% accessibility and visibility to both slow- and fast-moving parts and fixtures in a variety of shapes and sizes. A powered mobilized pallet rack system with load capacities of 16,000 pounds per carriage, ActivRAC® 16P (Powered) is a great way to store the heaviest of items, from pallets of inventory and repair equipment to anything from pallets of inventory to repair equipment, beer and wine barrel storage to slow-moving parts, which was the case at Fresenius Medical Care Holdings in Northern California. A manufacturer and innovative medical care products, Fresenius realized that the parts in their inventory was rapidly increasing—and as most of the parts were slow-moving, they needed to be able to manage those parts and free up critical, accessible space for fast-moving items at the same time. An ActivRAC® 16 heavy-duty mobile shelving system was able to assist—and now, Fresenius’s warehouse is operating more smoothly than ever. 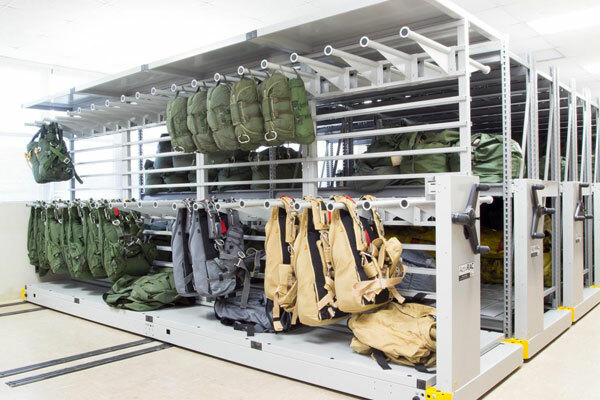 Offering 30,000 pounds of storage per carriage, ActivRAC® 30P is our most heavy-duty mobile shelving solution out there. In nearby Fort Carson, Colorado, the United States Army’s SSA (Supply Support Activity) building was in need to highly secure storage with immediate access to cargo containers. 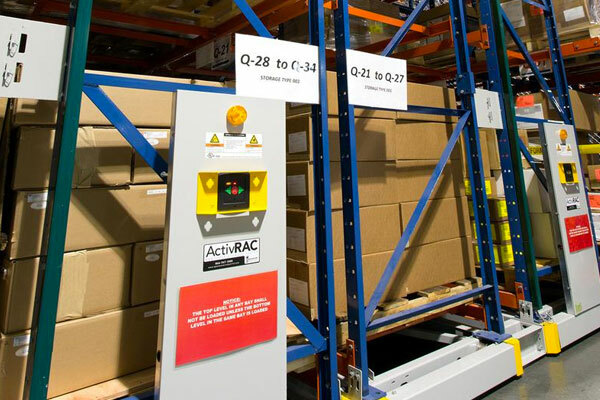 An ActivRAC® 30P heavy-duty mobile storage system allowed the SSA staff access to the materials they needed immediately without having to go unlock and lock the cargo containers each time materials are loaded and unloaded—saving time and helping to maintain organization of the unit’s materials. Interested in finding how which heavy-duty mobile shelving system might be right for your facility’s needs? Contact Systems & Space for a complimentary space and storage analysis.